As this week's contribution I'm sharing a Genfunny from 1905. Yesterday just disappeared on me and I didn't get round to posting my weekly list.... but a girl's gotta have fun! An exciting event in the world of Ausralian Geneablogging took place this week when Jen Coates set up a Facebook Group for Austalian Local and Family History Bloggers. Membersip has lead me to a few "New to me" blogs and unlocked the identity of some previously anonymous (to me) bloggers. Thanks Jen for your invitation to join the group. Membership of the group is open to personal bloggers while those who blog for insitutions and societies are not able to join! If you fit the criteria do look for the group on Facebook and ask to join up. Here is a selection from my reading this week. 1. I'm with Lois on this. 2. Michelle tells of a headstone from 1804. 3. Sharon asks if an historical figure influenced her grandmother. 4. Confused by Irish surnames? 5. Spelling variations stumped Prue. 7. A well travelled book. 8. Patsy wanders down Melbourne's laneways. 9. I love a library story, thanks Trisha. 10. Shelley shares a mudmap. 11. Diane in praise of blogging. Su talks of the "joys of blogging"
12. I think we all are similarly captivated Linda. This past week has seen me with a case of Writers' Cramp as I have prepared our Christmas cards ready for posting. Of course that got me thinking about Christmas cards in Australia so I popped over to Trove to see what I could find. 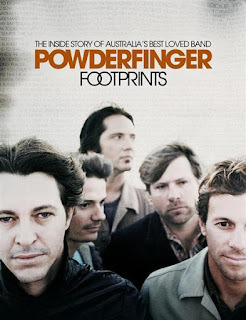 As I was doing the Christmas shopping I spotted a book about Australian rock band, Powderfinger. I considered buying it for my son who is a fan of the band but I bought it for my Genealibrary. The book's RRP is $AU45 and I would probably have passed it by at that price. It was on sale at QBD Books for $AU14.95, a more palatable price. Are you wondering why I bought this for my Genealibrary? Not long ago we discovered from a newly found elderly cousin that Mr GeniAus is related to band member, Darren Middleton. My genealogy software tells me that Darren is Mr GeniAus' second cousin once removed. They are descended from John James Ball and Emily Royds. This book has a chapter about Darren that contains plenty of information about his life.... true Geneagold! You can see why I just had to buy it. Usually when I receive an invitation to join yet another Facebook group my reaction is "ho hum not another group"! Yesterday as I was travelling on the train to the city an invitation came through that brightened my day. It was from Jen Coates who has set up a FB group just for Australian Local and Family History Bloggers. What a fab idea at a time when several of my blogging mates are taking a sabbatical from blogging, we all need a little encouragement and support to keep going. As one member of the new group has said " I need some motivation to blog more often and this may help. I got out of the habit of blogging regularly a few years when I was studying and have not managed to get myself back into it to the same extent." As I was travelling into town I added some of my mates to the group and on the way home added a few more but I didn't know how to send invitations to the many bloggers I know via Google+ and other social media channels. It's pleasing to see the way that the members of the new group have embraced the concept and it would be great to see membership grow. Jen describes the group "I have had something like this in mind for a while as there seemed to be no place to discuss issues that were common only to history web writers. I would be very happy for everyone to introduce themselves once but I don't see this page as promotional as this would merely double up on the multiple avenues already available and we would be preaching to the converted! I see this page as a resource for creative history writers." If you fit the above criteria and would like to join the group you could try clicking on this link and seeing if it gives you an option to request membership. Hope to see you in the group soon. As I've a busy day ahead of me tomorrow I'm preparing this post ahead of time. 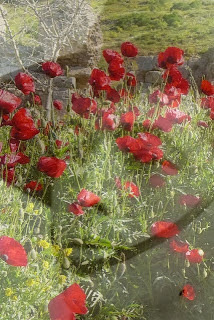 There was quite a collection of Remembrance Day posts this week. I had int4ended to prepare a second GAGs list of these but time has caught up with me. I hope you enjoy the following selections. 1. I love travelling vicariously with my Genimates. I enjoyed Shauna's journey. 3. And so say all of us. 7. Carmel demonstrates how two favourite tools can work together. 9. Diane helped organise a magnificent family reunion. 11.Pauleen has been busy relocating and settling into her new environment. It's great to see her return to blogging with such a comprehensive post. One of my favourite searches in Trove is a simple search for a Surname and Place eg I regularly rerun Duncan Cobar and Tierney Dungog to see if I can happen across new articles about these branches of the family in Trove. This morning I was thinking about my Pusell branch and recalled that they lived in Burraga and Rockley so firstly I put Pusell Burraga into Trove's search box. I didn't get round to searching for Pusell Rockley because I got some valuable new hits from the Pusell Burraga search. Reading on I discovered that William had been conveyed to hospital in Bathurst in October 1946 (1946 'GENERAL NEWS. ', National Advocate (Bathurst, NSW : 1889 - 1954), 1 October, p. 2, viewed 10 November, 2015, http://nla.gov.au/nla.news-article161335588) and in 1952 (1952 'MEDICAL CASE. ', National Advocate (Bathurst, NSW : 1889 - 1954), 24 July, p. 2, viewed 10 November, 2015, http://nla.gov.au/nla.news-article161527353). There are too many of these ambulance reports to list but one from 1949 caught my eye as it named Pusell's residence as "Baldridges, Burraga" giving me a new place lead to follow up. (1949 'AMBULANCE CASES. ', National Advocate (Bathurst, NSW : 1889 - 1954), 25 March, p. 2, viewed 10 November, 2015, http://nla.gov.au/nla.news-article161699439). In addition to articles about Great-great-Uncle William I found enough mentions of other family members to keep me amused for several hours. Do you return regularly to Trove to carry out similar searches? A prompt from Geneabloggers over the weekend reminded me that I had missed my blogiversary last week. I must be hiding my age well because, although Geneabloggers told me that this blog had started in 2009 I thought I was a tad older than that. I've put a reminder in my Google Calendar so that I won't miss this event next year when GeniAus turns 8. Going back through the archives I discovered my first GeniAus post from 5 November 2008.
Who was I kidding? Crowded? Back in 2008 there were very few geneablogs around, I am so thrilled that, when I retired, I found a niche in which to blog. I had been blogging about education, libraries and technology for several years and enjoyed communicating via this medium and wanted to continue writing bits and pieces. I am pleased that many of my Australian Genimates have taken up blogging, presently I follow over 200 Australasian Blogs in my RSS reader. Unfortunately I didn't keep a screen shot of my blog as it appeared in 2008. The first image in 2011 I have comes from The Wayback Machine. 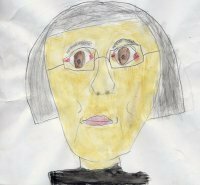 Although the blog has had a number of new looks over the years the thing that has remained constant is my GeniAus portrait done by my then 7 year old granddaughter. Entering the Geneasphere via this blog opened up a whole new world to me. I am so grateful to all the friends and opportunities it brought my way. 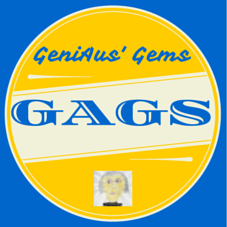 Thank you to all who have stopped by GeniAus over the years, I appreciate your friendship, interest and support. My life has been enriched by through Geneablogging. I am hopeful for the future because from my observations while many people give up on blogging (and I miss their contributions) there is a group of enthusiastic newbies continually joining our ranks. Now let's concentrate on this week's contributions (and I had a huge list to choose from this week). 1. Because I can I'm sharing a post of mine to thank those who assisted with our Hornsby Shire FHG display last week. 2. A new blogging theme from Jennifer. 3. Mole in South Africa reminds us that it's Remembrance Day next week. 4. A yummy Christmas gift from one of my fave blogs. 5. Shelley sends out a challenge to FindMyPast. Will she get a satisfactory reply? 6. And Carmel highlights an issue with MyHeritage Snmart Matches. 9. I've fond memories of reading these stories. 10. What inspires you to blog? 11. A catchy title for this post. 12. An interesting interpretation of a topic. 13. I had to make it a baker's dozen this week so you can reflect on Paula's message. We have chased Mr GeniAus' Parkinson ancestors from Yorkshire to Australia and back again and haven't been able to gather much info on them. I noticed earlier today that The Armidale Express and New England General Advertiser (NSW : 1856 - 1861; 1863 - 1889; 1891 - 1954) is now digitised on Trove and I knew that the Parkinsons when in Australia resided in Armidale so off I went to Trove where I did a simple search for Parkinson in that newspaper..... and I found some stuff. I didn't expect to find an obituary for William Henry Parkinson of Batley, Yorkshire, Mr GeniAus' Great-Grandfather. This is so exciting as it confirms the children's names and locations and tells us something about the old boy's activities. Mr GeniAus' Great Uncle, George Henry, stayed in Australia when the rest of the family returned to Yorkshire. An item in 1903 relayed some sad news for the Parkinson family. I didn't realise that another brother, Robert was working in Liverpool, NSW but I knew that Harry was in England. This item filled me in. Another article (1927 'Mr. G. H. PARKINSON. ', The Armidale Express and New England General Advertiser (NSW : 1856 - 1861; 1863 - 1889; 1891 - 1954), 19 July, p. 2, viewed 2 November, 2015, http://nla.gov.au/nla.news-article192071565) that I will try to transcribe later tells me that George Parkinson was afforded a hearty farewell by the congregation of the Armidale Methodist Church when he left his position at Armidale Motors to move to Ipswich in Queensland in 1927. And finally in 1949 there is news of George's death. I wonder if there is an Ipswich paper digitsed on Trove that will tell me more of the Parkinson story. There's nothing like being ready ahead of time and I'm ready for Saturday. 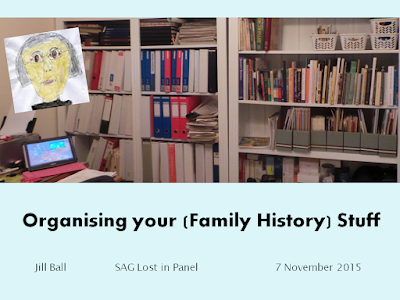 I was thrilled when I was approached by Heather Garnsey from The Society of Australian Genealogists to join a panel for their first virtual "Lost In weekend : how to do your Family History in 2015" that will be held on Saturday and Sunday 7 and 8 November. Being part of this event which I think is the first online conference orgainsed by a genealogy society in Australia is so exciting. Events like this that allow distant members to connect with presenters in other locations should be a part of all major society education programs. A healthy number of genies have registered for the event which is open to members and the public - if you have been considering attending it would be wise to register now as there is a ceiling on the number of registrations. You can view the program and register at the SAG website. I will be appearing between 1:30 and 2:30 pm on Saturday in What’s the best organising system? 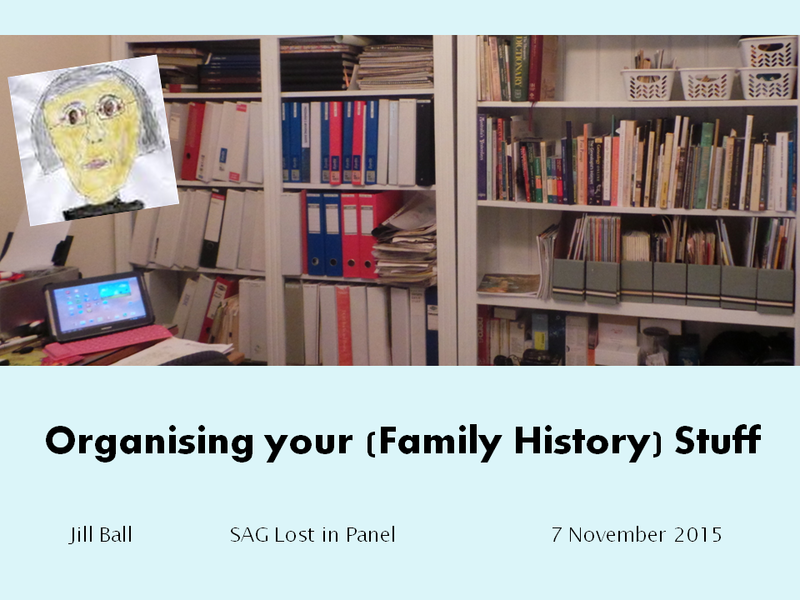 – Panel discussion: described thus "Family history research generates a lot of documents, photos and certificates. A panel of researchers discuss how they organise all their stuff, to help you choose a system that works for you." I heard today that I will be joined by fellow SAG members Jennie Fairs and Judy Keena - perhaps we can call ourselves The J Team. My greatest challenge is that we are each to speak for only 8-10 minutes and then answer questions from attendees. I think I'm going to be speaking very fast. I hope some of you will join me on Saturday. Many of my fellow Ambassadors for the 2016 Rootstech Conference have been busy sharing details of the Keynote speakers that have been announced for the Thursday Rootstech Sessions. You can read all about them here. As a foreigner I have only heard of one of the three speakers, Steve Rockwood, but I am not perturbed because the Rootstech organisers have consistently sourced excellent people (most who were previously unknown to me) as keynotes. Some like Curt Witcher and Jay Verkler (of the amazing hair) have really resonated with me as they shared very strong messages about the Future of Genealogy. How about the barefoot boy, Josh Coates, who presented without shoes in wintry Salt Lake City? Judy Russell's keynote in 2014 was a real wakeup call and multi-faceted David Pogue in 2013 (whom I got to interview - watch it here) was a real showman. This year young Australian, Tan Le, had many in tears while Old Rocker, Donny Osmond, took us on a trip down memory lane. And then there was everyone's cousin, A J Jacobs, who befriended the geneabloggers. I passed on an invitation to interview this funny guy and have been regretting it ever since. One of the reasons I attend Rootstech is to hear new (to me), inspiring, entertaining and challenging speakers and I am more than satisfied with most of the selections made by the organisers each year. I don't mind who they serve up - the keynotes will make my trip worthwhile. The number of blog posts that appear in my RSS feed each week has been slowly diminishing. Some of my geneablogging mates have disappeared from the scene and some are blogging less frequently. I miss you all and hope that you'll return to blogging real soon. Where have all the bloggers gone, long time passing? Where have all the bloggers gone, long time ago? Oh, we miss our blogging friends? Oh, when will you ever blog? Oh, when will they ever blog?